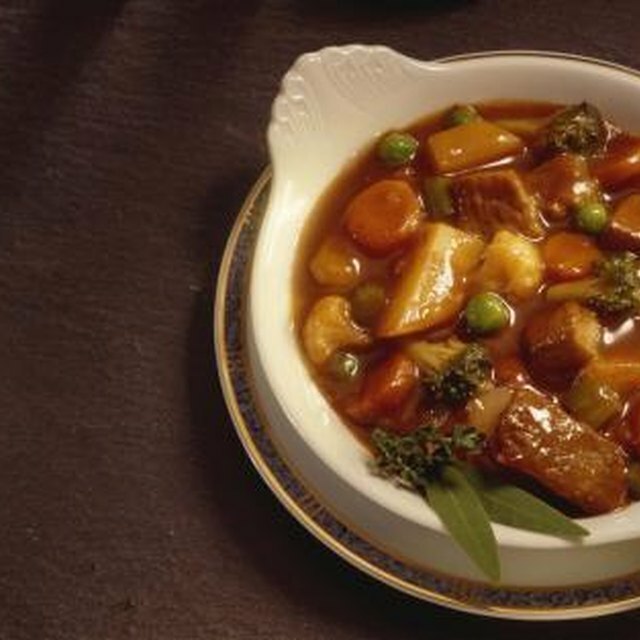 Leftover venison neck can be turned into a tasty stew or casserole. Venison neck is a tough cut, like the meat from a deer's shanks, and it's usually only available to hunters or their friends. Like the shanks its flesh is chewy and stringy, and it's filled with tough connective tissue. 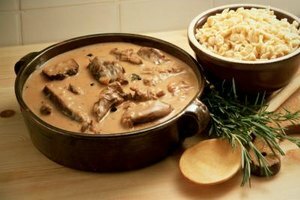 Yet it's well worth a little bit of time and patience, because after several hours in a slow cooker it becomes rich, luscious and tender. Preparing a neck roast in the slow cooker takes minimal preparation, but results in a highly satisfying cold-weather meal. Pat the neck roast dry with clean paper towels and rub the cut ends to remove any bone fragments. Trim away any surface fat with a sharp knife because that fat will give the the roast a pungent, gamey flavor. If your roast is boneless, check to ensure that it's tightly rolled and tied. Heat a heavy skillet or Dutch oven over a medium-high burner. When it's hot, add a tablespoon of oil and place the neck roast in the pan. Turn and sear the roast until it's deeply browned on all sides, then remove it to your slow cooker. Pour a small amount of broth into the skillet and swirl it to dissolve any browned-on juices from the pan. Pour the broth into your slow cooker. Season the venison with salt and pepper. Add any other flavoring ingredients, such as onions, garlic, bay leaf or juniper berries, to the cooker. Pour in enough beef broth, venison broth, water, red wine or other cooking liquids to come 1/3 to 1/2 of the way up the venison roast. Slow-cook the roast until it's fork-tender, approximately 3 to 4 hours on your cooker's high setting or 6 to 7 on low. Remove the roast from your slow-cooker and transfer it to a serving platter. Cover it loosely with aluminum foil and let it rest for at least 15 minutes before carving. Boneless neck roast cooks slightly more quickly than bone-in, but the range of cooking times is similar for both. Boneless roasts are easier to carve, but the cylindrical muscles are easily removed from the neck bones after cooking. Just remove each muscle in turn, and slice them for serving. The neck bones can make a rich and flavorful stock, for soups and stews. Venison neck has enough flavor that even water makes a good cooking liquid, but stock is better. Use red wine or dark ale for up to a quarter of the liquid, for added flavor. When the roast is cooked you can strain the cooking liquid and thicken it to make a complementary sauce for the venison.